I am so not the audience for this. I didn’t see Avengers: Assemble and I wasn’t a great fan of the original movie (The Avengers (1998)). It’s been Americanised of course, and whilst Robert Downey, Jr is better in the role than Ralph Fiennes, he’s no Patrick Macnee. The female agent, Scarlett Johansson, is no Honor Blackman or Diana Rigg or Linda Thorson. So a group of superheroes wisecrack and kickass their way into a secret lair to destroy an irrelevant Big Bad and find an A.I. that allows evil kindly and benevolent arms dealer Tony Stark to restart his programme to create a Colossus style computer which will bring Peace In Our Time. Presumably unfamiliar with how well this worked out for Neville Chamberlain, Stark is confused when the A.I. managed to give itself bodily form and decide that the way to save the village is to destroy it. Only The Avengers can save the world. With help from Royal Holloway. Impact. So, let’s see, Whedon has a track record in handling ensemble casts — check, we have all kinds of superheroes, various Big Bads, Mr Ultron himself, a couple of Eastern European types who know the name Stark from the wrong end of a missile and most of the time we can keep them all tidy in our minds as to who is where. There’s a confused bit with is the result of the second recurring trait — the Scooby Gang need to fall out with each other — and when the Eastern European Scarlet Witch tries to mess with their heads this appears to be happening. And gets a bit confusing and deleted scene for the DVD territory. They never quite lose it. Oh, yes, and then there’s the feminism thing. We get told — or did Whedon tell us? — he’s a feminist. Which explains why Black Widow seems to spend much of the movie holding someone’s hand. But it’s never her story, whoever the she is. There are a couple more female characters — but then superhero movies don’t like too many women with agency. You can see there’s some grappling for complexity — Stark is clearly a monster, arms dealers are clearly scum, but it’s never quite delivered. It’s not even in the same league as “Do I have the right?” moral dilemmas. The audience liked it though — I’m guessing there are in-jokes for the in-crowd. There were appreciative laughs at what felt mundane pieces of dialogue. I’m just wondering where that convenient lake came from in the denouement and what the impact of dropping large rocks into it would be. Students seem to infect each other. You suddenly notice a typographical error which you swear you have never seen before and then it’s everywhere. The confusion between defiantly and definitely. The collision of minuet and minute. Language charges, of course, and a lot of our spelling and punctuation is the invention of compositors from the late sixteenth to the early nineteenth century and there is nothing inherently natural about any of this. I heard part of a recent episode of Radio 4’s Word of Mouth which told us to chillax and not worry. Were able to distinguish between “we’re” and “were”, with or without apostrophes. “It is a niece film,” one student wrote a couple of years ago. So, the latest nonsense that’s memed its way around is “relatable”. It seems to be used to refer to The Hunger Games (Gary Ross, 2012), as in “Katniss Everdeen is very relatable.” I don’t recall coming across this more than a year or so back, but suddenly it’s everywhere. Ponders. Paraphrases. “Katniss Everdeen can easily be told about.” Nope. Makes no sense. Ponders. Paraphrases. “Katniss Everdeen can be easily be connected to something or other.” Nope. Makes no sense. I just have the connotations in my head of her having lots of sisters and brothers. But within the context of an essay on film — even an essay on the books but that aint my bailiwick — surely what they are trying to say is that it’s easy to identify with the character. “Katniss Everdeen can easily be related to.” You probably want to reach for Laura Mulvey or Linda Williams or someone to theorise it a bit. And so I turned, with exactly the high-handed sense of smugness that middle aged academics trade in, to look at the OED. That can be related to […]; with which one can identify or empathize. The citation they give is 1965: “The research indicated that boys saw teachers as more directive, while girls saw them as more ‘relatable’.” Note the scare quotes there — but the meaning is clear. The odd thing is why it’s only just emerged in my marking. I confess that I had never heard of Emily Carr, apparently one of Canada’s best loved female painters. Of course, the list of female painters is depressingly short — although I’m fond of female surrealists such as Frieda Kahlo and Leonora Carrington, not to mention Laura Knight, Paula Rego, Elisabeth Blackadder and Bridget Riley… I presumed that she might have some connection to the Group of Seven, in part because the Dulwich Picture Gallery had a show of their work a few years ago. If memory serves there were a number of landscapes painted on wood, painted on location in the wilds of Ontario and points north, accompanied by full scale canvases. 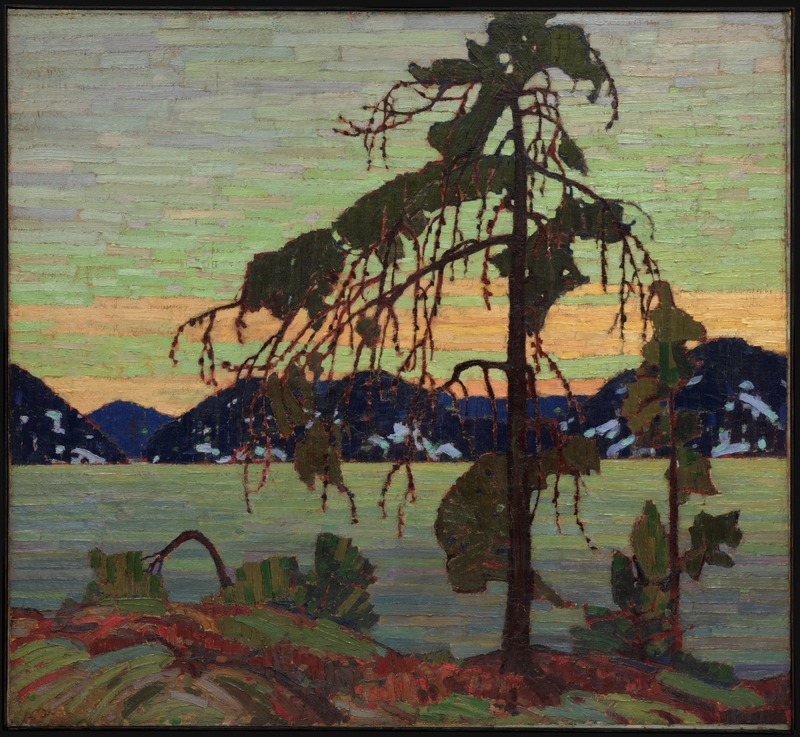 Slightly before them was Tom Thomson (1877–1917), who I think I saw a show by in Toronto (unless it was in Adelaide…). The landscapes are strangely depopulated, presenting Canada as a Terra Nullis, untouched by human hands. Of course, there were any number of indigenous native groupings, out of sight. It left me a little uncomfortable — but we’ll come back to that. Emily Carr’s exhibition began with paintings of forest from the 1920s – in a sense toward the end of the story. The leaves spiral, there is a real sense of action in the painting – although, of course Carr writes “If there is no movement in the painting, then it is dead paint”. 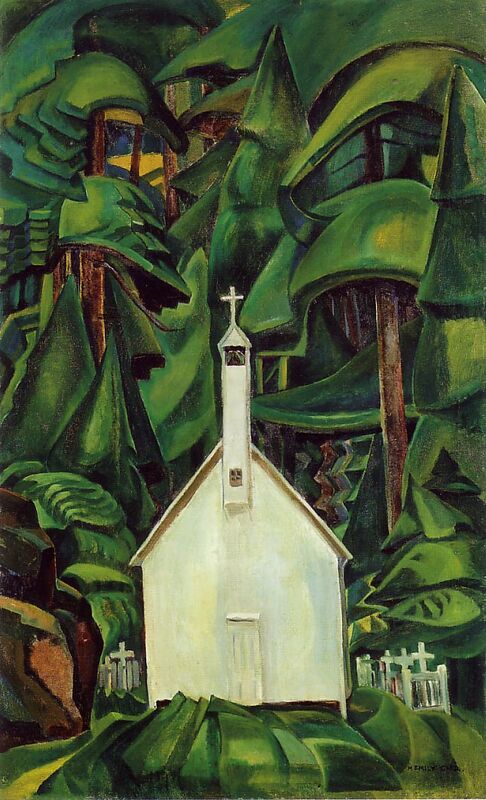 One of the most significant paintings is “Indian Church” (1929). This is not Terra Nullis, because there is clearly the impact of western society on the forest, a whole way of thinking in the new world. But she was also interested in theosophy and mysticism and argues that “Metamorphosis between species and states is the only predictable feature of the cosmos”. Magic? Maybe. Daughter of English immigrants to British Columbia, Carr had an interest from an early age in the wilderness outside the settlement. She had art lessons as a child and, despite the death of her parents, went to study at the California School of Design, San Francisco where she learned how to paint outside. 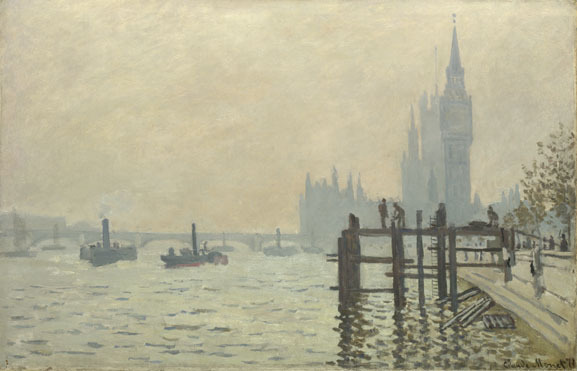 On graduating she went to London, to the Westminster School of Art and took courses at places such as St Ives. Back in Canada she taught and painted, before travelling in 1907 to Alaska. She was inspired by Native American culture and art, and started trying to reproduce it in her paintings: “Indian art broadened my seeing, loosened the formal tightness … I was as Canadian-born as the Indian but behind me were the Old World heredity and ancestry”. Her paintings stay largely deserted – although some of the sites she depicted had been abandoned through disease or general depopulation. Here’s Janice Stewart: “Emily Carr found in her unproblematic identification with the Indians of the Canadian west coast a second skin to inhabit, which seems to have allowed her to paint and write beyond the gendered boundaries of contemporary conventional aesthetics. 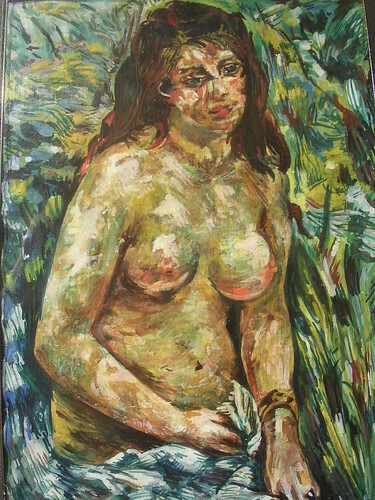 Carr identified the creative part of herself as Indian.” But Stewart is more interested in Carr’s writing than her paintings. 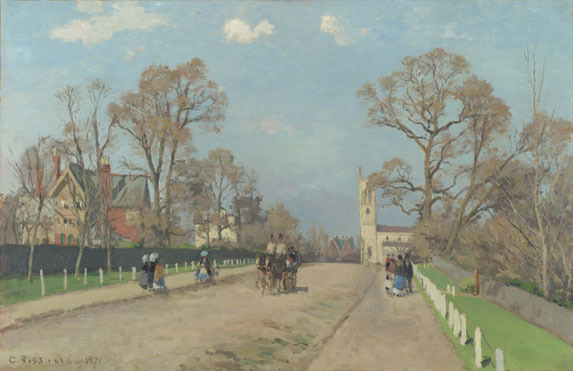 In 1910, Carr took a trip to Paris, where she was exposed to the Impressionism (and I guess early Post-Impressionism). Again, this would feed into her art – and it did strike me that some of her landscapes had the flavour of Vincent Van Gogh to them (whom she referred to as a “crazy poor chap”). 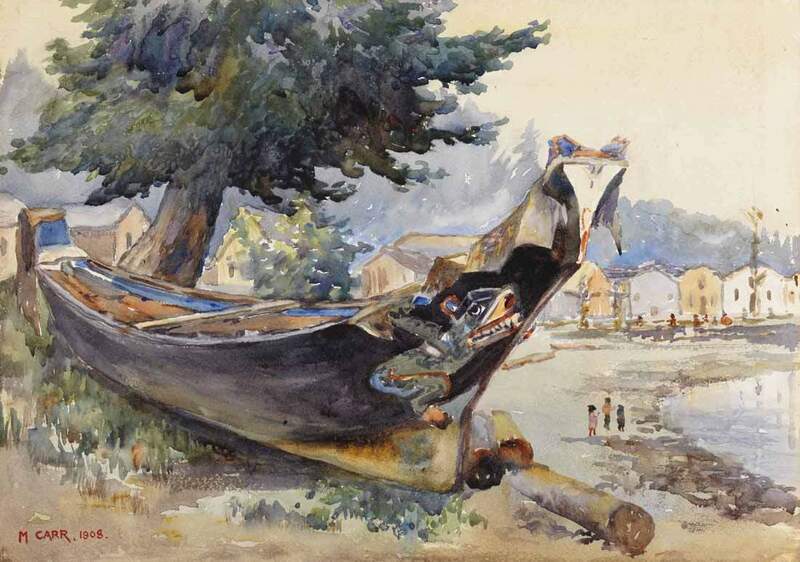 One striking painting is of Kwakwaka’wakw war canoes (1908 and 1912)– and this one does contain figures. I’m torn – I don’t have enough data from the exhibition to know whether the elimination of the indigenous (whilst retaining their cultural productions) shows respect for them or is part of the Terra Nullis drive. As a female artist who kept not quite being taken seriously, she found something in the peopels she met to inspire her. But is is a form of romanticisation? Gerta Moray labels it “aestheticized nostalgia”, and suggests that Carr’s attempt to preserve what she perceived as a dying culture contributed to the decline. 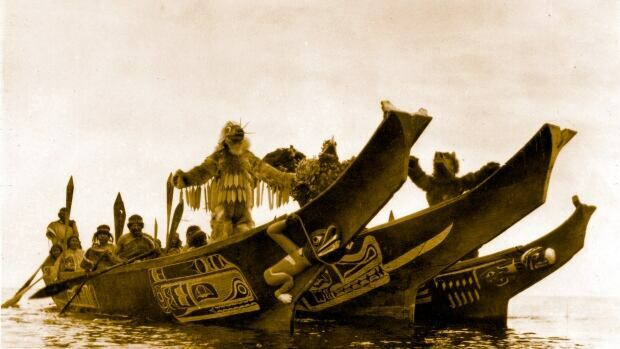 Moray, Gerta (1993) Northwest Coast Culture and the Early Indian Paintings of Emily Carr, 1899-1913. Diss. University of Toronto, 1993. Morra, Linda (2004) “‘Like Rain Drops Rolling Down New Paint’: Chinese Immigrants and the Problem of National Identity in the Work of Emily Carr,” American Review of Canadian Studies, 34(3): 415-438. Stewart, Janice (2005) “Cultural Appropriations and Identificatory Practices in Emily Carr’s ‘Indian Stories’”, Frontiers: A Journal of Women Studies 26(2): 59-72.